An Advertisement has been released by Sashastra Seema Bal (SSB) to remind the candidate to download SSB Admit Card 2015 for Head Constable Exam. So all applied candidate should download SSB Admit Card 2015 for Head Constable Exam very soon from the portal website of SSB. Candidate those who qualify in PST and PET shall be eligible for written. Applicant who successfully qualify written exam will be go for skill test. Go to official website at www.ssbrectt.gov.in. Find out Admit Card tab and click on it to proceed. Now, You can download SSB Head Constable Admit Card 2015 by different methods i.e. OMR Number/Name & Date of Birth(DOB)/SSC Registration No & DOB/Roll Number. Choose the method of your choice. Submit the details to see your SSB Head Constable Admit Card 2015. Save & Download the Admit Card as PDF. 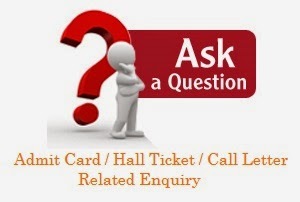 Take printout of Admit Card/Hall Ticket for examination purpose.